This week I was filled with grief for a former co-worker who lost his only son. All week Jeeps and I have been upset, questioning the world and its tenuousness, reaffirming each other and the kids, trying to remember what is important. Redman, especially, got kissed and manhandled a lot this week. In my sad distraction I found myself all too easily sliding back into not eating. Seeking comfort as well as inspiration, I re-read Molly Wizenberg's A Homemade Life and she delivered on both fronts. Sobbing through the chapters of her beloved father's death, I arrived at the recipe for "Ed Fretwell Soup." This Italian vegetable creation was delivered to the Wizenbergs by Ed and Barbara Fretwell, during the time of Molly's father's long decline. 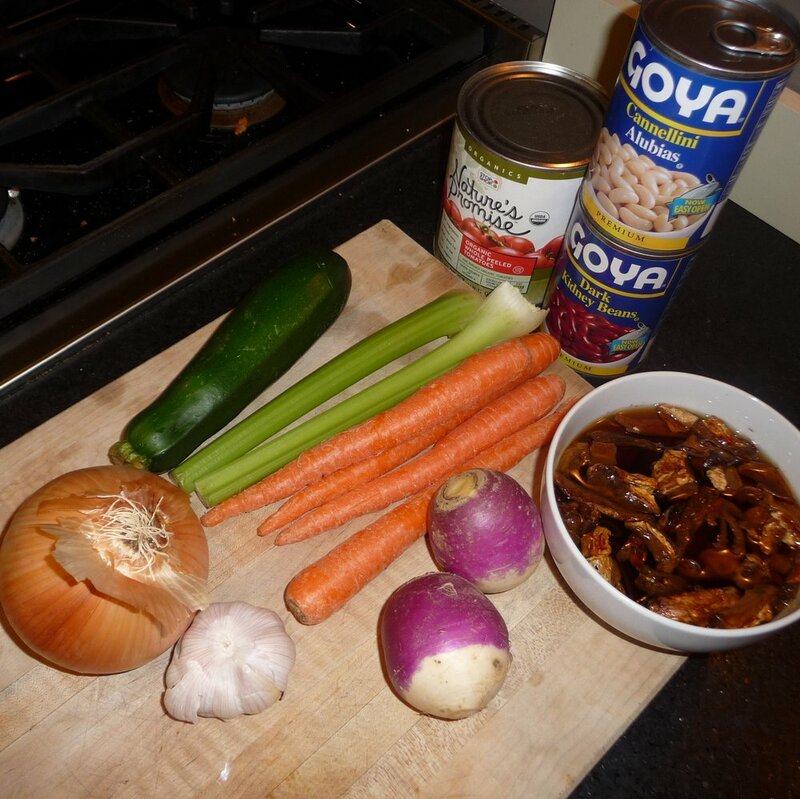 It's one of the best soups I've had, too, and funny thing, because it seems like it's just another minestrone soup recipe. Yet it's not. I don't know what makes it different or so special. But I made it tonight and ate four bowls of it. And about eight oatmeal-chocolate-cherry cookies. The recipe from Homemade Life involves dried beans and their preparation, which involves overnight soaking. I wanted to make this tonight, right now. I had no dried beans and I tend not to have good luck with them anyway. This involved rearranging the recipe, plus I added a few other tweaks. So for the original, click here to go to the January 2005 of Molly's blog Orangette. 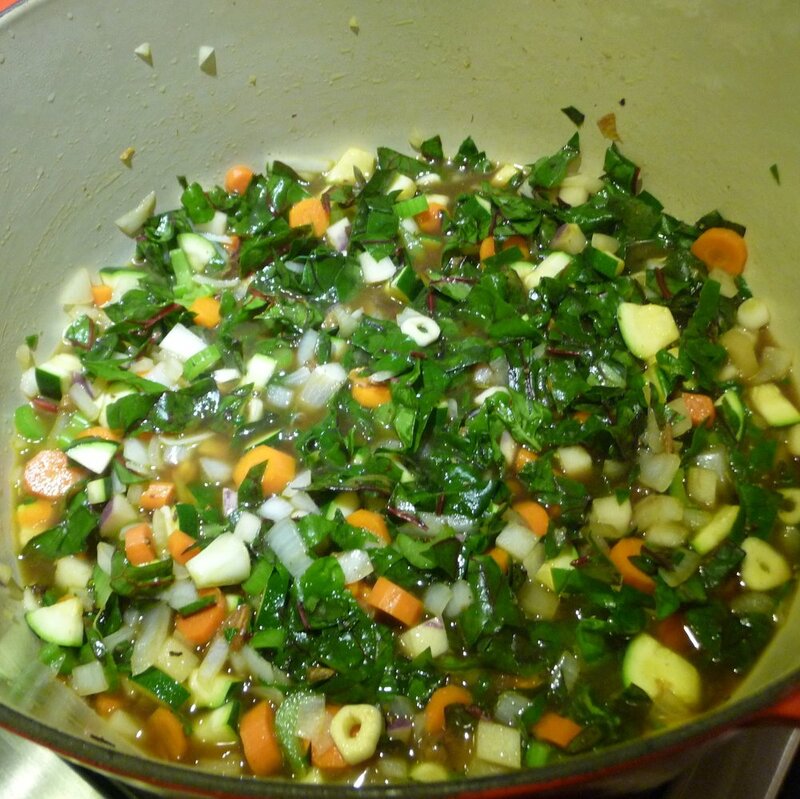 Scroll down to the post called "On industry, indolence, and Italian vegetable soup". Or, for crying out loud, buy yourself a copy of the book because it is well worth having. Here is my sped-up tweaked version. The original recipe caveats this makes a lot of soup. If you don't have a large enough pot or enough people, Molly suggests halving the recipe. Which I did here. 1 can cannelini beans, 1 can red kidney beans, 1 can chick peas, all drained and rinsed together. You'll use 1 cup to 1 1/2 cups of the mix as you see fit. Refrigerate the rest for a 3-bean salad. Best-quality olive oil and parmesan cheese for serving. In a large soup pot, warm the olive oil over medium heat. Add the onions, celery, carrots, garlic, and turnips. Saute for 10-15 minutes, stirring frequently. Add the zucchini and broth, increase the heat to medium-high and bring to a simmer. Add the Swiss chard, tomatoes, sage, and reserved mushroom liquid. Cover the pot and turn heat low to keep at a simmer for 1 hour. It will seem there is far too little liquid for all the vegetables in the pot but don't worry: the vegetables will give off a good amount of water as they cook. After an hour, stir in the beans (as much as you like). Taste to see if it needs salt, I found it didn't need a speck. Cover and simmer another 20 minutes. Stir in the parsley. Serve, and be comforted, with a hearty glug of good olive oil over the top of the bowl and some parmesan cheese sprinkled about. It's not the prettiest soup in the world, but my God, it's good. And if you're going to fret, you should Fretwell. I served some to Panda and she wrinkled her nose. "It doesn't look very good," I said, "but it tastes really good." "If I don't like it, is there something else?" she asked in a small voice. I assured her there was leftover spaghetti and meatballs to fall back on. "Well...okay," she said reluctantly, and took a small spoonful. She still looked doubtful but she did take the bowl downstairs to the TV room. Puttering around the kitchen, I kept an ear to the basement stairs and sure enough, up floated that sound so dear to a mother's heart: a spoon repeatedly clinking against the bowl. Followed soon by footsteps up the stairs and those wonderful words, "Can I have some more?"